Snippets of Jack: "I Am Here To Negotiate"
"I Am Here To Negotiate"
Now that Pintel and Ragettie have cornered Elizabeth in the closet, Elizabeth has no other option but to blurt out: "Parley!" In her super British accent, it sounds kinda like Polly. Pintel: "What?" Elizabeth: "Parley. I invoke the right of parley. According to the Code of the Brethren set down by Morgan and Bartholomew (the French), you have to take me to your captain." Pintel: "I know the code." Elizabeth: "If an adversary demands parley, you can do no harm until the parley is complete." Ragettie: "To blazes with the Code." Pintel: "She wants toe be taken the the captain and she'll go without a fuss. We must honor the Code." Normally, it would see me like Pintel is being a civilized pirate (if there is such a thing), but he says this is creepily that it's hard for Elizabeth to be thankful for another few minutes of her life. So they honor the code by taking her onto the Black Pearl. We catch a glimpse of Captain Hector Barbossa standing on the quarterdeck, watching the fighting go on with Jack the monkey on his shoulder. One of the crew mates, however, does not appreciate Elizabeth's presence. Crew mate: "I didn't know we was takin' on captives." Pintel gets very excited about this for some reason: "She's invoked the right of parley with Captain Barbossa." Elizabeth sees this as the time to break loose and act superior: "I am here to . . ." The crew member quickly slaps her across the face and says, "You will speak when spoken to." Now, normally I would be begging for him to do it again, but at this part of the movie, I don't exactly hate Elizabeth, entirely. I mean, she's going through a lot at that moment, being on a pirate ship and all, at least hear her out. Barbossa doesn't approve of this behavior either: "And ye will not lay a hand on those under the protection of parley." Crew: "Aye, sir." Barbossa: "My apologies, miss." For slapping her in the face, robbing her house, or destroying her town? 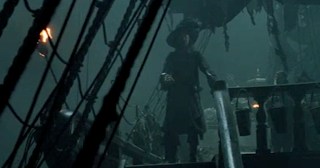 Elizabeth: "Captain Barbossa, I am here to negotiate the cessation of hostilities against Port Royal." Barbossa is rather taken aback by this: "There were a lot of long words there, miss. We're not but humble pirates. What is it that you want?" Elizabeth: "I want you to leave and never come back." This is rather amusing to the pirates. As though they'd just give up pillaging and plundering because some mildly pretty girl tells them to. Barbossa: "I'm disinclined to acquiesce to your request." Now it's Elizabeth's turn to not understand. Barbossa: "Means 'no'." Elizabeth Swann does not take no for an answer: "Very well." She storms over to the edge of the boat and dangles the medallion on a string into the sea. Elizabeth: "I'll drop it." A cannon goes off in the background for dramatic effect. The whole crew suddenly are paying close attention to her. Barbossa, stiffly, says: "Me holds are burstin' with swag. (swag) That a bit of shine matters to us?" Then he breaks what little character he has: "Why?" Elizabeth reads him like a book though: "It's what you've been searching for. I recognize this ship. I saw it eight years ago on the crossing from England." Elizabeth recalls the time she rescued Will as a child and took the medallion from him. 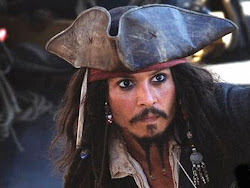 He was stranded in the water because lo and behold the Black Pearl had attacked his ship looking for that very medallion. Well, as you can see they never got it, hence why they are having this conversation in the first place. Barbossa: "Did you now?" Elizabeth, decides a different tactic. Elizabeth: "Fine. Well if it is worthless, there's no point in me keeping it." She loosens her grip on the string and it falls an inch closer to being lost into the ocean. Why they can't just dig it up later, I've no idea. Barbossa and the entire crew leap forward and cry "no!". It's a good thing they're pirates, not actors. Barbossa realizes that it's really no use any more. They need precisely what Elizabeth has to offer. Barbossa: "You have a name, missy?" Elizabeth: "Elizabeth . . . Turner. I'm a maid in the governor's household." I'm pretty sure that's incorrect. But this makes the life of Elizabeth all the more valuable. Barbossa: "How does a maid come to own a trinket such as that? Family heirloom, perhaps?" Barbossa wants to know if she's related to Bootstrap and therefor has the trinket. Elizabeth: "I didn't steal it, if that's what you mean." It wasn't, but Barbossa takes this as, "It was passed down to me from my father who used to be a pirate on this ship, Bootstrap Bill." Barbossa; "Very well. You hand it over, and we'll put your twon to ur rudder and ne'er return." Elizabeth hands him the chain. Elizabeth: "Our bargain?" Crew member: "Still the guns and stow 'em." Signal the men and make good to clear port." But as they are leaving, Elizabeth cries: "Wait! You have to take me to shore! According to the Code . . ." How exactly do you know pirates' code again? Barbossa has other plans though: "First, your return to shore was not part of our negotiations not our agreement, so I must do nothing. Secondly, you must be a pirate for the Pirates' Code to apply, and you're not. (Jack would beg to differ). And thirdly the code is more of what you'd call guidelines than actual rules. (Tell that to Captain Teague). Welcome aboard the Black Pearl, Miss Turner." So acting's not his strongest suit, but with a mind like that Barbossa could make a nice lawyer. So now Elizabeth is trapped on the Black Pearl because she failed to specify her release. You know what they say, the devil is in the detail.